As in other developing countries, there is a huge gap between the city and the countryside in Iraq. City-dwellers and villagers live, literally and figuratively, in different worlds. For example, in the cities, Islamic law and practice to a certain extent shape the facets of daily life, while in the countryside life is ordered primarily by traditional loyalties based on blood relations. The dichotomy between city and countryside is not, however, absolute. From the early 1940s a massive movement from the countryside to the city began. 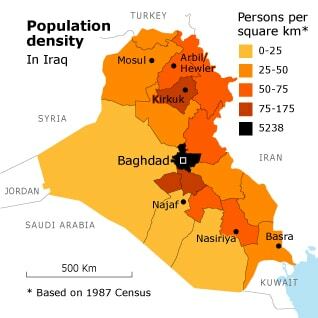 In 1930 one quarter of Iraq’s population lived in cities; in 1960 that had risen to half, and that figure presently stands at 67 percent. In two generations, the demographic balance between city and countryside had tilted entirely from one side to the other. For city-dwellers, their own background continues largely to determine their behaviour. Their houses, often made of reeds and mud, look like the houses in the region from which they came. Migrants to the city generally settle in neighbourhoods where others from the same tribe or area – and thus of the same religious persuasion – have settled. These neighbourhoods are thus ethnically, religiously, and tribally homogenous. Just as in tribal or village society, people there can fall back on others with a common background for protection and support. The strong concentration of various population groups in certain parts of the country and the separate housing patterns in the cities inhibit intensive contacts between groups, and ethnic, religious, and tribal divisions are sometimes reinforced by economic inequality. Thus, before the 1958 revolution in Iraq, much of the land in the south of Iraq was in the hands of Sunni Arab landowners, while it was worked by Shiite Arab tenant farmers. 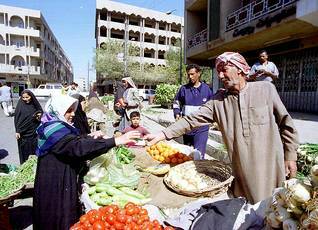 Around Mosul Arab farmers worked the land of Turkmen landowners.